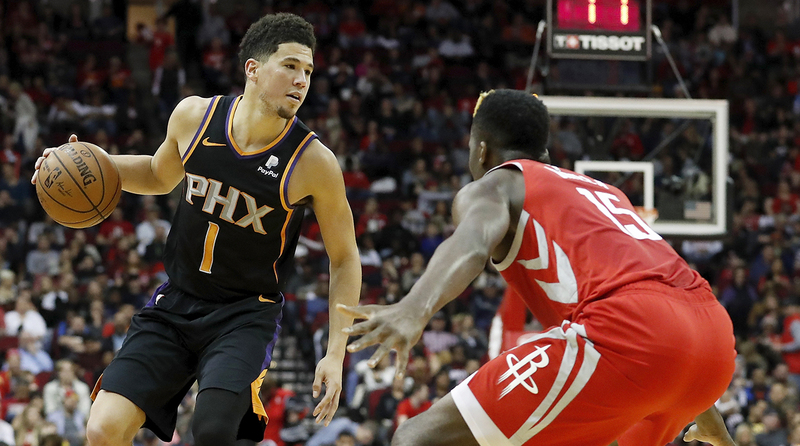 Phoenix guard Devin Booker is an elite scorer and has received praise from the NBA's biggest superstars but as the Suns continue to lose, questions about his overall game continue to follow him. Devin Booker went nuts again. After putting 59 points on the Jazz earlier this week, Booker added an additional 50 against the Wizards Wednesday. He's only the seventh player in the past 40 years to have consecutive 50-point games, and at 22 years and 148 days old, he's the youngest ever to do it. He's also the second player in NBA history to have consecutive 50-point games in consecutive losses, after James Harden accomplished that feat in 2017. Now there's Booker exploding in a pair of very Suns-y losses this week. Monday's outburst came during a 33-point blowout that included raucous ovations for Jimmer Fredette and intentional fouls from the Jazz to keep Booker from hitting 60. Wednesday was a shootout that came down to the final minute, when second-year center Thomas Bryant hit a go-ahead three, and then, after a Jamal Crawford three tied it, Bryant added game-winning baby hook with three seconds left. Somehow both of those outcomes feel perfectly on-brand in Phoenix. All of this leads to some obvious follow-up questions: How good can Booker be? How seriously should anyone be taking these massive scoring nights if they are coming in (mostly) losses? And if all of Booker's scoring isn't leading to Phoenix winning, are we sure his future is as bright as it seems? People have been calling Booker a future superstar since his rookie year. He signed a five-year, $158 million contract in July, he has the charisma of a natural celebrity, and players like Dwyane Wade, Kobe Bryant, and LeBron James have all expressed admiration along the way. But the Suns continue to lose, and so a bunch of half-trolling, half-sincere questions continue to follow him. 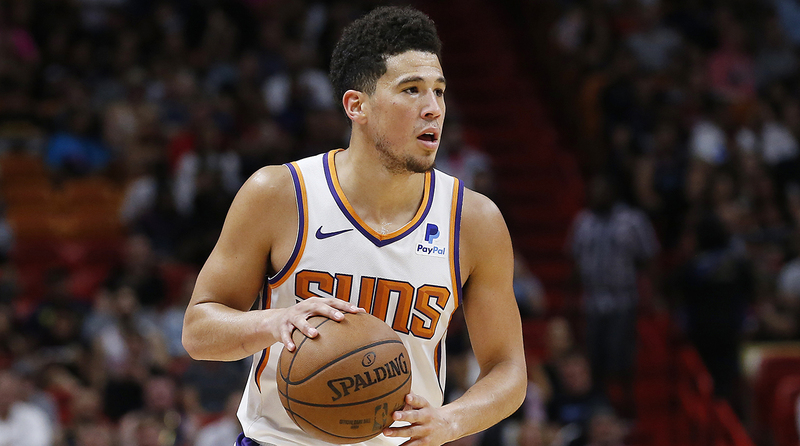 To begin with, one problem in any Booker conversation is that the Suns have been the most reliably dysfunctional team in the league since Booker arrived in Phoenix. If we're being honest and fair, a team like this should provide plausible deniability to any underachieving star on earth. The Suns kept Earl Watson at least a year longer than they should have, completely mismanaged the Eric Bledsoe situation, drafted Josh Jackson, Dragan Bender, Marquese Chriss, and Deandre Ayton with the lottery picks they've had since landing Booker, and they still don't have a viable starting point guard 18 months after trading Bledsoe. Prior to Booker's outburst this week, the most notable Suns moment of the season came when Kevin Arnovitz and ESPN detailed years of sketchy management practices in a piece that included a vivid anecdote starring a handful of defecating goats. The biggest problem with conversations surrounding Booker is that a lot of people are projecting his game and grading his progress in the wrong context. He puts up numbers that leave him looking something like a young James Harden—26.5 ppg, 6.7 apg, 4.2 rpg, 46.5 FG%, 32 3FG%—but Harden's not really who he is, and it's probably not who he'll ever be. There are certain superstars who can raise the floor for their entire team; that isn't Booker. There there are also players who can't raise the floor of bad teams, but can raise the ceiling of good teams. That seems like a more plausible explanation for Booker and what we've seen so far. He isn't James Harden; he's more like a sequel to Kyrie Irving. Jeff Siegel had a very good look at Booker's game over at Dime Magazine this week. As Siegel notes: "the best guys in the league are hunting threes, layups, and free throws like never before. The peak of this theory is James Harden, who is as allergic as anybody in the NBA to non-paint mid-range jumpers; those shots account for just three percent of his attempts on the season. For Booker, that number is 20%, with a further 24% coming from “short midrange,” defined as outside of four feet but inside 14. He’s very good at these shots, hitting 45 and 48%, respectively ... but the math doesn’t lie. Even an elite midrange shooter is going to have trouble being efficient on the aggregate, since the value of an at-rim or three-point attempt are so much higher." It's true, while Booker is taking a healthy 6.5 per game this season, he still makes his living slithering through defenses for midrange jumpers and quick pull-ups in the lane. This is one reason it's harder to run everything through Booker and expect to come away with a better-than-average team offense. Harden pairs historic usage with historic efficiency; Booker can sometimes approach the former, but he'll probably never come close to the latter. It just isn't his game. Even if he improves his shot selection later in his career, what makes Booker special is his ability to create any shot he wants in the midrange and going toward the rim. Those skills become a lot more valuable in games that matter. As great as a player like Harden is, one reason he's struggled in the playoffs is that his game doesn't have as much variety. When officials swallow their whistles and defenses counter what he does well, Harden can't always counter them back. Booker probably could, though, just the same way Kyrie can. Booker can score at every level, he can dissect any defensive scheme you try to throw at him, and he can create offense in a dozen different ways when things break down in the halfcourt. The value of that variety is something that analytics can't quantify, and it's why players revere guys like Booker and Kyrie even as various analysts remain quietly skeptical of the hype. Will he ever be good enough to carry the Suns to be 50 regular season wins on his own? Probably not. He's not LeBron or Harden, and he's not Kobe, either. He doesn't really make his teammates better, and he's not dominant enough to render their shortcomings irrelevant. Additionally, he needs to show more consistent effort on defense and he needs to continue working on his body. To the latter point: Booker shouldn't be blamed for all the problems in Phoenix, but his sporadic minor injuries over the past few seasons probably haven't made it any easier for that team to build momentum with a coherent identity. Still, these Booker games are a good reminder of how special his skillset is, and that they usually come in the middle of mind-numbing Suns losses is a reminder of how complicated his next few years could be. Kyrie Irving didn't find a way to win until LeBron James came back to Cleveland, and with all due respect to Booker's comments earlier this year, it's unlikely that a superteam is coming to the desert. That may leave Booker in a tricky spot. He's skilled and valuable in ways that numbers can't capture, but it's hard to make the case that he raises anyone's playoff ceiling when he's playing with a 20-win roster. That's the better discussion to have after every lights out Booker performance. The skills he has are very real, this isn't a bunch of hype, and he could be a lot more valuable than the "good stats, bad team" guy he appears to be. The question is whether he'll ever have enough help to prove it in Phoenix.